This second edition, of a book originally published in 1986 as Portfolio No. 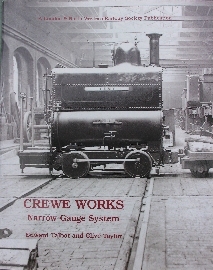 5 in the Society’s series, was published in September 2005 to coincide with the Crewe Works Open Days. It has been produced with revised text and more illustrations. Many people, both members and non-members of the LNWR Society, have gone to great trouble to provide information and to help in a variety of ways. Michael Bentley printed photographs from his collection; Harry Jack made his notes from the archives at Kew available, as well as a number of maps and plans; Andy Lowe produced drawings specially for the book, and provided items from his own collection; David Patrick, as well as providing photographs, went to Crewe Library and Cheshire County Records Office to obtain plans of the works at various periods; Peter Sladen solved several mysteries relating to the Joiners Shop and to the track; Mike Swift provided information from his records and knowledge of all things narrow gauge; the unfailing enthusiasm of John Wardle and Mike Williams, as always, was a source of constant support; and others who helped in various ways too numerous to describe were: Roger Bell, Dave Fowke, Christopher Hill, P.W.M. Griffin, Barry C. Lane, Norman Lee, Andrew Neale, David Pennington, Paul Rouet, Mark Smithers, Peter Stanton and Peter J. Stead. Finally, the staff at the library of the Institution of Mechanical Engineers in London were unfailingly helpful. We thank them all for their help. Without it this book could not have been produced. Edward Talbot & Clive Taylor.